Andrea Parkins :: February 14, 2010; 10:00 – 11:00 pm :: WKCR – 89.9 in NYC or online. For her performance on WKCR, Parkins will be playing amplified objects, electronic accordion, and laptop electronics/live processing. Andrea Parkins is a New York-based composer, sound/installation artist and interactive electronics performer internationally acclaimed for her uniquely gestural and textural approach to her electronically-processed accordion and inventive use of customized live sound processing. Together, her laptop electronics and Fender-amped accordion create a sonic language of lush harmonics, noisy concretized disruption, and soaring electronic feedback. Parkins’ work has been presented in New York at the Whitney Museum of American Art (“Bitstreams” exhibition), The Kitchen (“New Sound/New York”), Diapason, Roulette and Experimental Intermedia; and at contemporary music, sound, and intermedia festivals/venues throughout the US and Europe, and in Latin America and Asia. 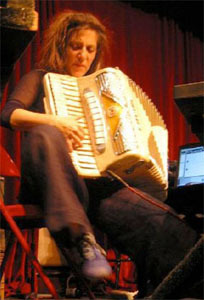 Throughout 2010, Parkins will tour in Europe and the US in support of her new CD on Important Records, FAULTY (BROKEN ORBIT) – a through-composed work for amplified objects, accordion feedback, and processed instruments. You can listen to selections from Andrea Parkins’ music here, tune in to WKCR 89.9 in New York City, or listen online.